There are a lot of crazy visual things in the world of The Hunger Games that I'm still dying to see, from the out-there clothes worn by the rich citizens of The Capitol to some of the beasts and traps set upon our heroes when they participate in the titular fight to the death. But so far all the images we've seen from the movie focus on the main three characters standing in the woods looking at each other-- Katniss (Jennifer Lawrence) looking suspicious, Gale (Liam Hemsworth) looking rangy and earthy, and Peeta (Josh Hutcherson) looking like he doesn't know what hit him. It all fits with the characters as we know them from the series by Suzanne Collins, but it's not really the most dynamic thing you can show off about such a visually complex movie. 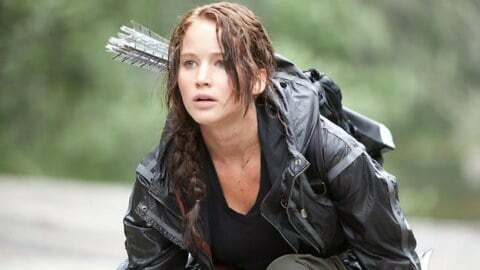 Two new images from the film have debuted at the official Hunger Games Facebook page, but don't get too excited-- it's a shot of Katniss and a shot of Peeta, apparently in the arena, looking beat up but determined. Take a look at them below. Hutcherson as Peeta is still wearing the black t-shirt and cargo pants we saw in those earlier images from Entertainment Weekly, which suggests that is in fact the uniform he's been given for the arena-- a far cry from the tunic and leggings described in the book. And as Katniss Jennifer Lawrence appears to be wearing some kind of leather jacket, again unlike anything described in the book-- but the shiny metallic arrows on her back suggest they're fancy weapons put in the arena by the Capitol, not the handmade arrows she used back at home in District 12. So these images are fine, just nothing groundbreaking or all that new. I don't really mind having a lot of the surprises in The Hunger Games saved for later, but it is a little frustrating getting excited about new images and then seeing essentially the same thing over and over again. The Hunger Games comes to theaters on March 23, so there are still plenty of half-reveals left to go between now and then.